The World Trade Center before Sept. 11. NEW YORK — When the Twin Towers came crashing down on Sept. 11, they left a gaping hole in lower Manhattan. One year later, no one seems to know how to patch up that wound. But the practitioners of the ancient Asian art of feng shui have definite ideas on what ought to go into, and what ought to be barred from, the reconstructed World Trade Center site. "A proper feng shui handling is really vital for resolution of the issues the destruction of the World Trade Center has raised," said Steven Post, CEO of the Geomancy/Feng Shui Education of Organization, or GEO. "The main thing is to recover or surpass the chi, the life energy, that we lost," added Post, "and New Yorkers have an instinctive feeling for this." Feng shui is a 3,000-year-old discipline that originated in China and aims to balance the "chi," or vital energy, of the places where people live and work. It is designed to create harmony between man-made habitations and the natural environment through architecture, design and the placement of furnishings. Though some people say it's a New Age fad, feng shui experts insist that at the root of the art is simple utility and an appeal to the instinctual sensibilities of humans. It's key to, or at least part of, most construction projects in East Asia. Though there are several schools of the art, experts who have visited the site agreed on several things. First of all, the original towers were a disappointment, in terms of feng shui. Though the Japanese-American architect, Minoru Yamasaki, incorporated elements of feng shui into his design, the overall effect was not good for the flow of chi, according to the experts. The structures created several examples of what are called a shar, or "poison arrows," elements that include sharp angles, which focus negative energy. Especially egregious was the fact that the towers were slightly offset from each other, meaning that their corners stabbed at each other's hearts. "It was the biggest poison arrow in the world," said Dina Trisk, who practices Taoist feng shui at Feng Shui Tao, in New York. "The towers each had corners with poison arrows pointed directly at the other building. It's all bad energy." 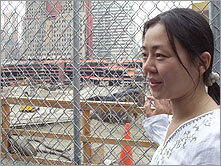 Zaihong Shen, author of Feng Shui: Harmonizing Your Inner & Outer Space, agreed. "The sides lined up like the buildings were fighting each other," she said. "And if the new building is going to be built, it's got to be built better against the wind. I went to the restaurant once, and you could be at the dinner table and your stomach was turning." Post, whose group is based in New York and San Francisco and follows the Black Sect Tantric Buddhist school of feng shui, added that the buildings were "fantastically ugly." 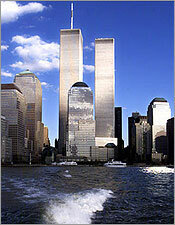 They were also unified on another point: The towers must be rebuilt, and rebuilt big. "The World Trade Center was the dragon mountain of downtown," Shen said, using the term for the most impressive structure in an area, which in a sense becomes the "leader" of nearby buildings, helping raise the chi for the entire neighborhood. She said the towers would have to be at least half as tall as nearby skyscrapers, meaning it would have to stand about 75 stories, at the least. "When a feng shui object is stolen or broken, you replace it with something improved, larger or more elegant or more expensive," he said. As for the six rebuilding plans currently being considered by the Port Authority of New York and New Jersey, the three experts replied to each with a resounding "No." Some plans had far too many poison arrows, and many were not bold enough, didn't include enough greenery or were unbalanced. Judging by reaction to the plans, the public agrees that none of them are quite right. Shen said the new buildings ought to face east and south to take in the morning sun, and not be placed where streets would flow directly at them. 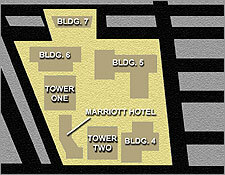 She also recommended that the footprint of the original towers remain exposed, perhaps outlined in water to take advantage of the element's youthful energy. "The water element is what is needed the most, because water will destroy the fire, and fire is the reason the buildings were destroyed," she said. Post said he'd prefer three round towers, each taller than the one before, representing the earth, humankind and the heavens, and reaching higher than the original buildings. Trisk championed the proposal of architect Derek G. Turner, which would create a cylindrical, greenery-covered tower topped with a pyramid that she said would channel the chi upwards. "This is the one," she said. "Symbolically, for money, this is amazing, to have plants at the foundation, to allow the city to grow again." ©Associated Press. All rights reserved. FOX News Network, LLC 2002. All rights reserved. Some video and photo essays contain graphic images -- caution is advised. Can't find FNC? Click here to find out what channel we are on in your area.